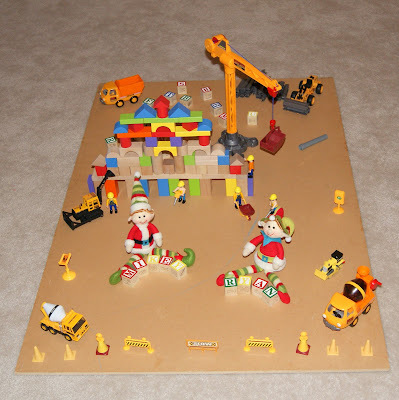 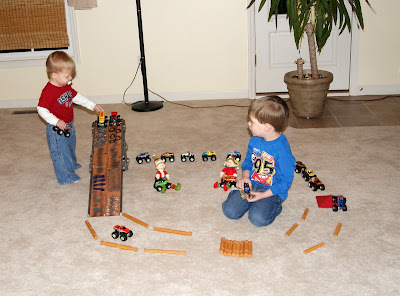 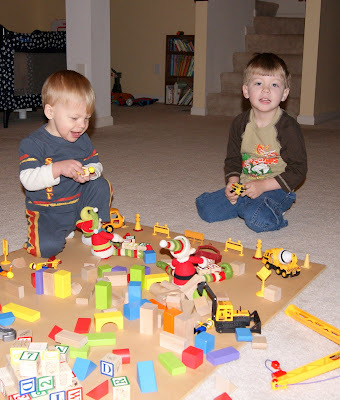 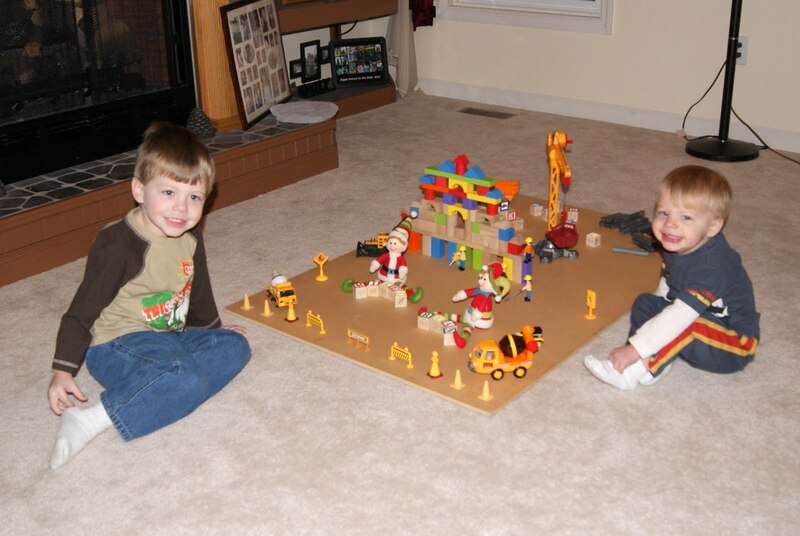 Buddy & Max found the construction equipment and all of the blocks, to set up a construction site! 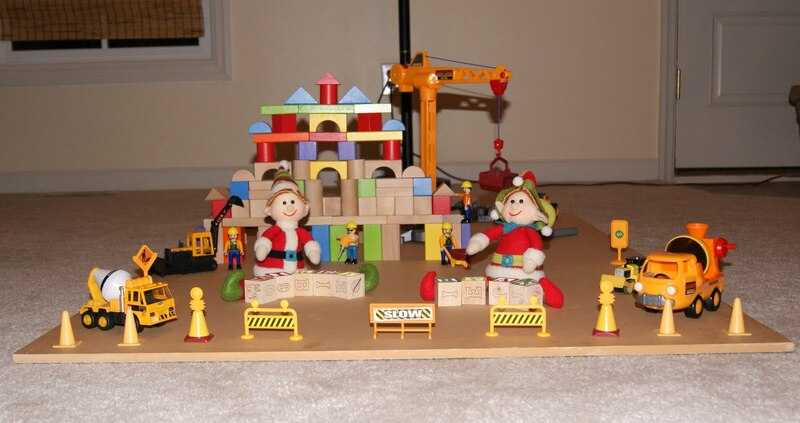 I love the tower of blocks! 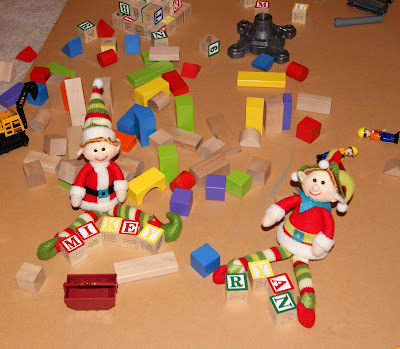 The elves spelled out the boys names! Mikey and Ryan were so excited! "The tower had to be knocked down!" 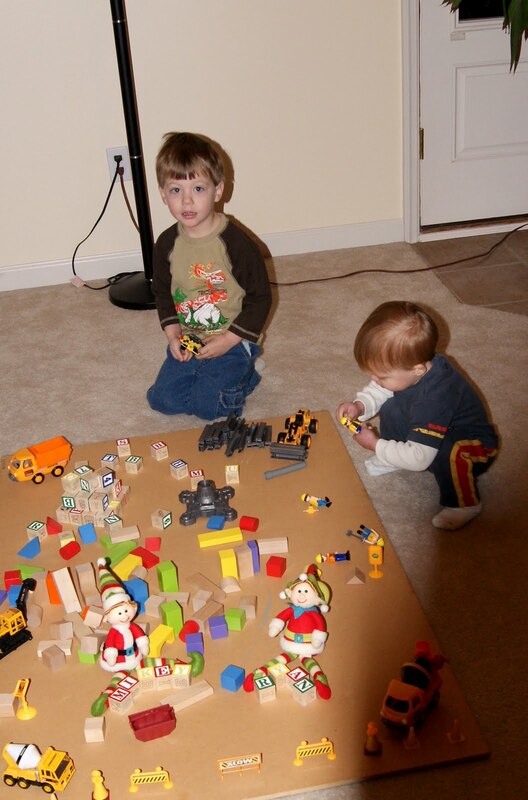 Buddy and Max, may or may not have taken a few blocks to the head, during the demo stage of construction. 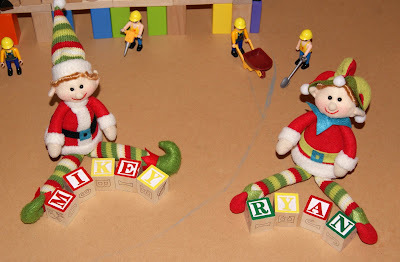 Where do elves, buy elf sized hard hats? Buddy and Max sitting on the mantel, before everyone went to bed last night. 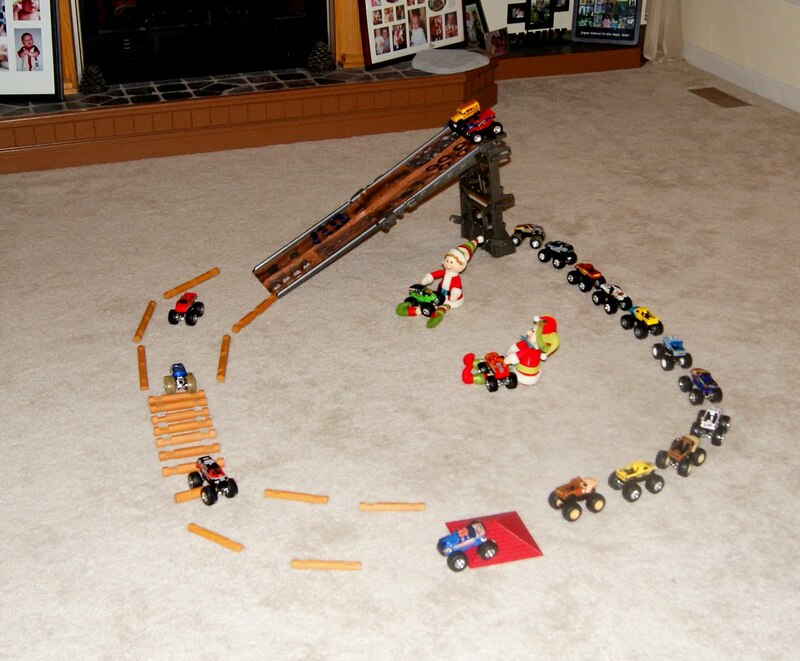 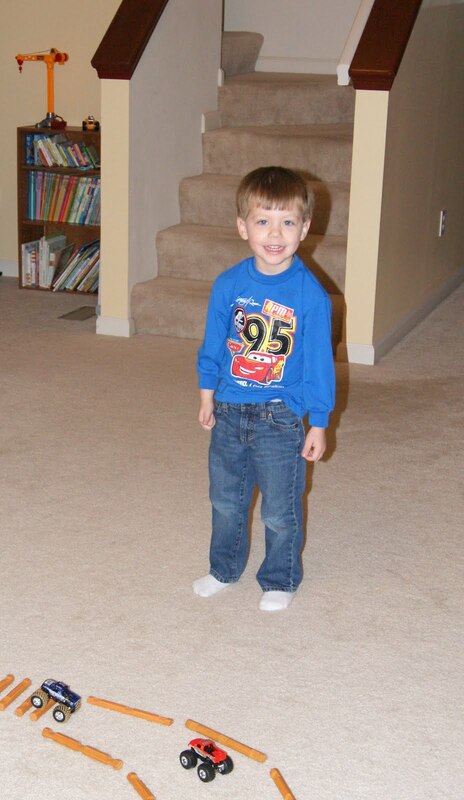 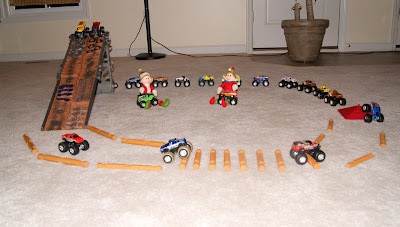 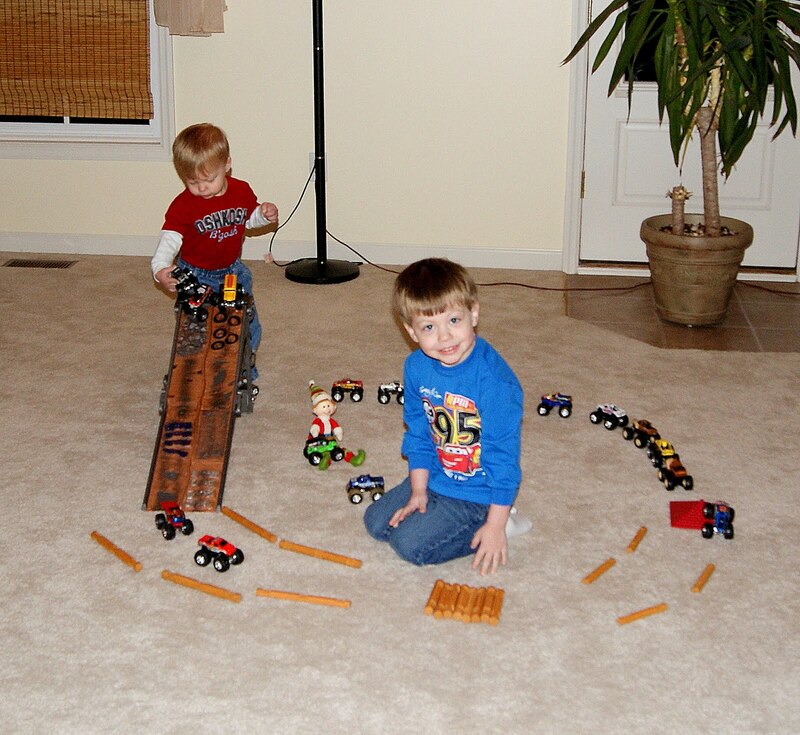 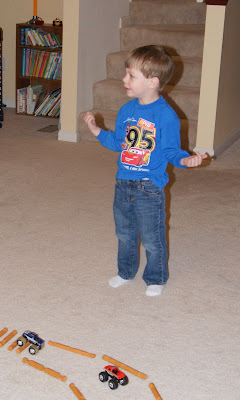 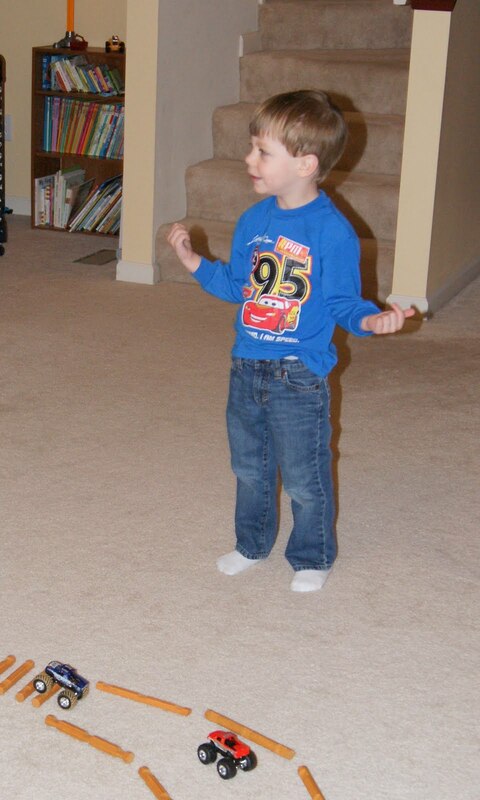 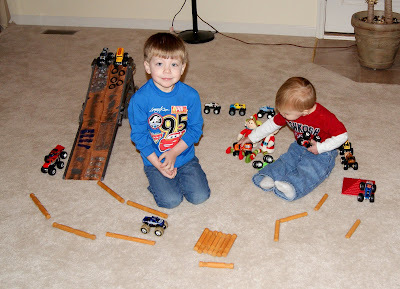 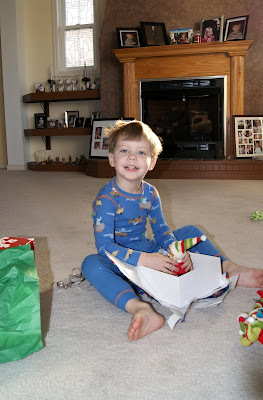 They quickly hopped off of the mantel, and found all of Mikey's Monster Trucks, and set up a truck Rally! Buddy has Grave Digger, and Max is playing with Back Draft...two of Mikey's favorite trucks! 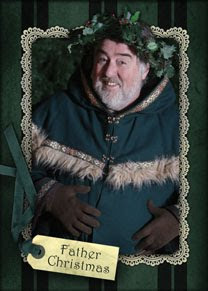 "Why did the elves make a mess?" 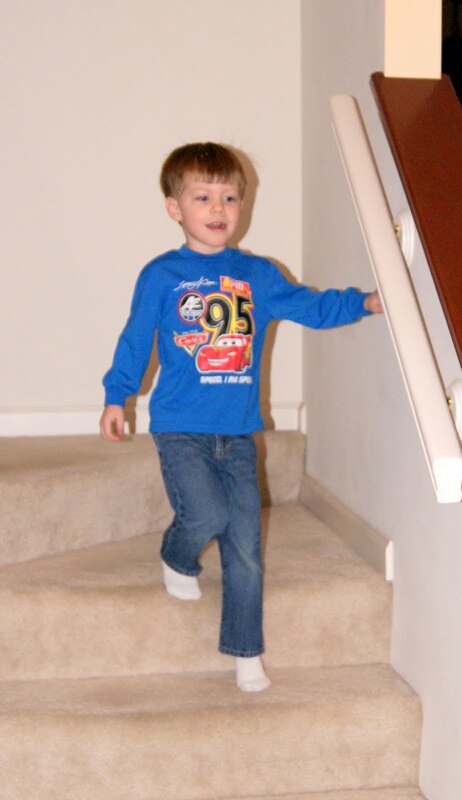 Ryan, setting up another race! Mikey and Ryan, loved the first night of Elf Mischief! 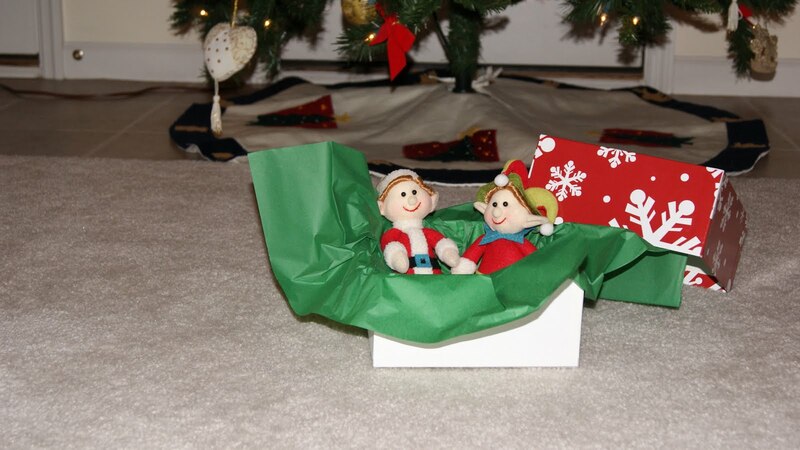 What will Buddy and Max do tomorrow...stay tuned! 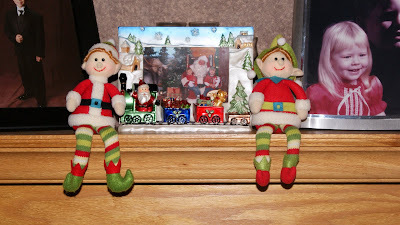 Buddy and Max have arrived! 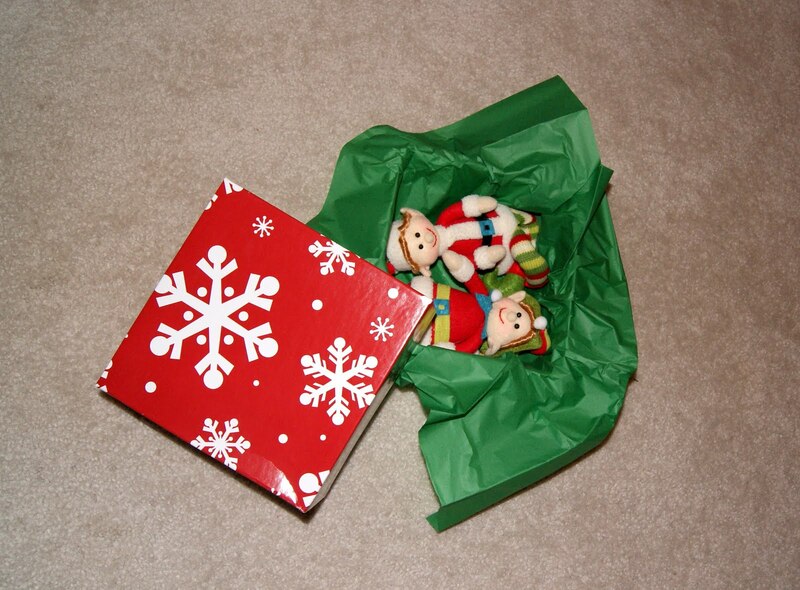 They thought it would be fun to change how they arrived this year, so they thought they would wrap themselves up in a gift box, and hide under the Christmas tree! "How long before the boys wake up?" 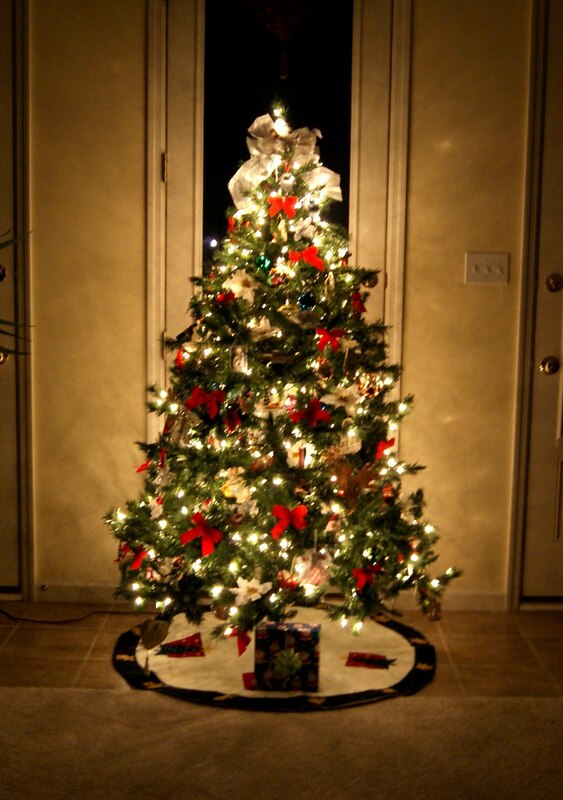 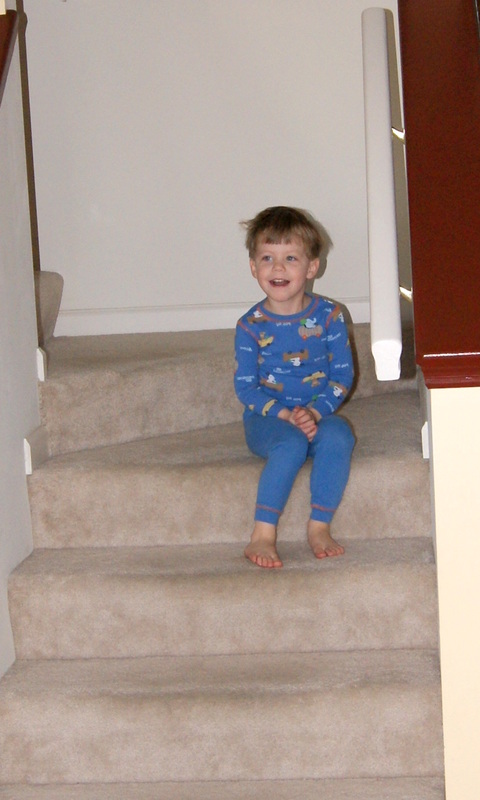 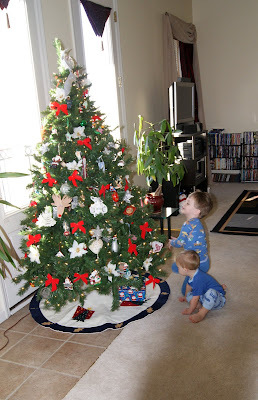 Mikey just sat on the steps and looked at the tree! 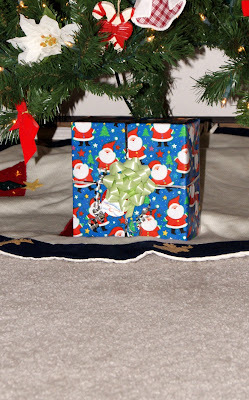 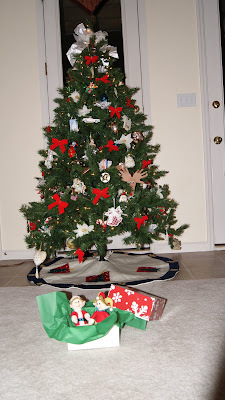 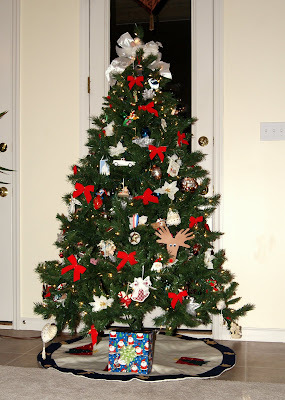 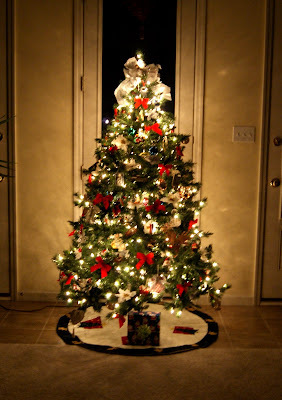 "Hey Mommy, there's something under the tree, who is it for?" 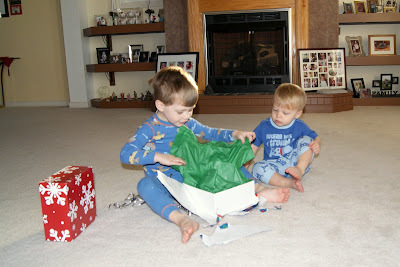 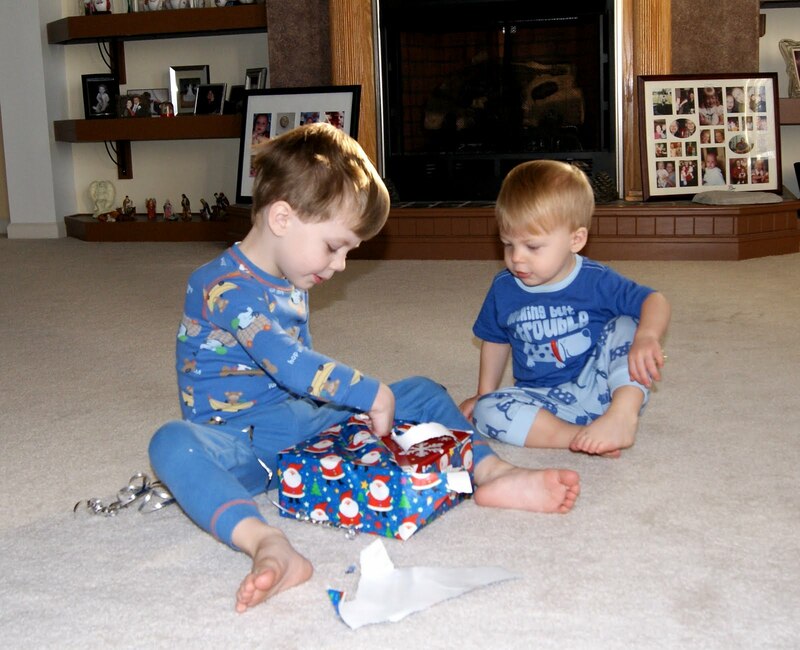 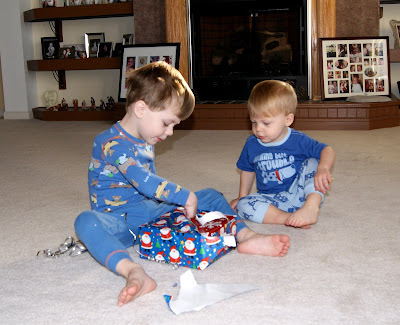 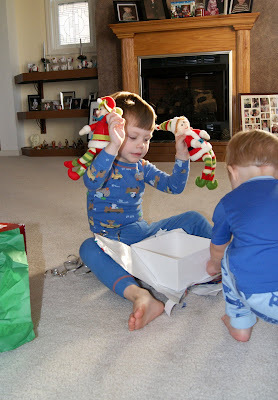 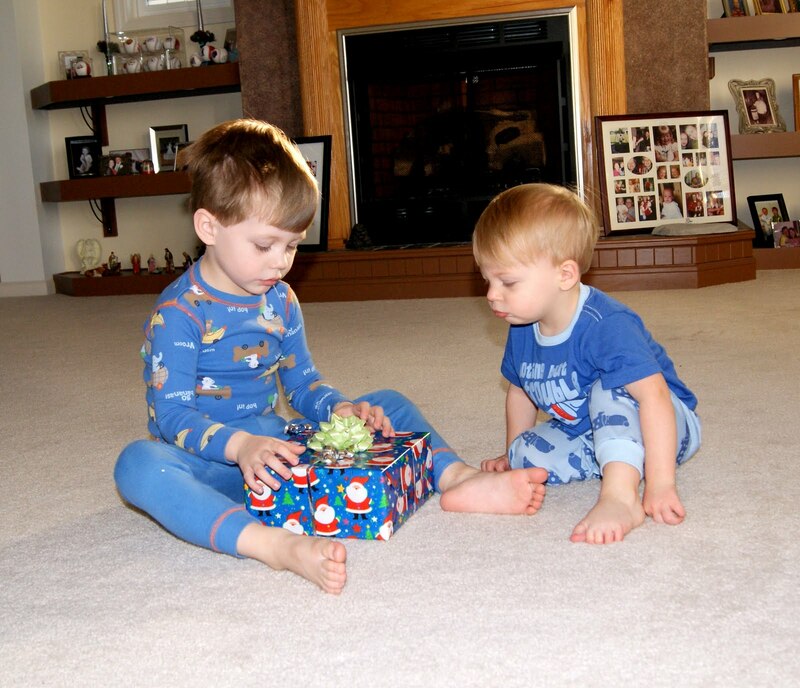 Mikey and Ryan, opening their gift! For some reason...this part took for EVER!!! 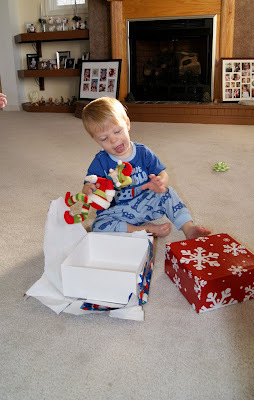 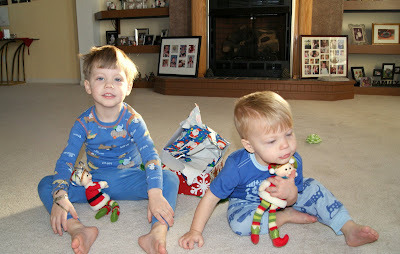 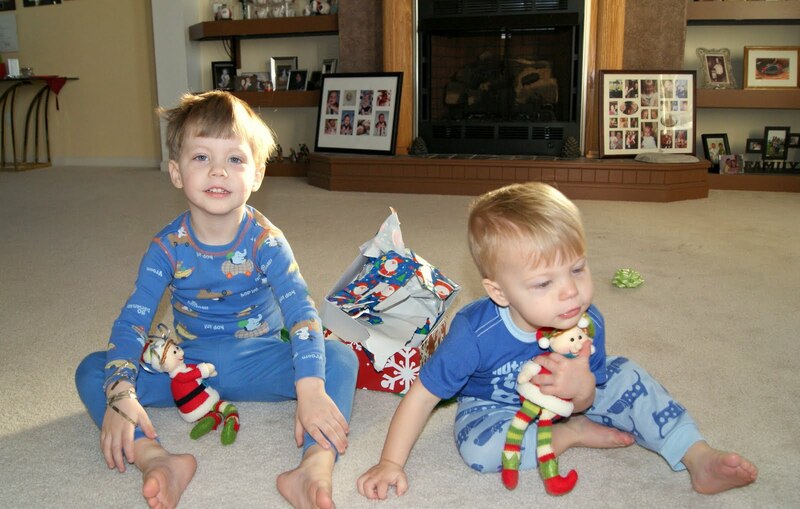 Mikey and Ryan were VERY excited to see their elves had returned! 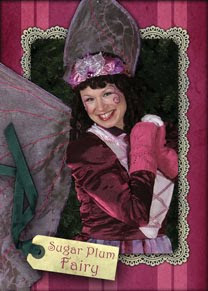 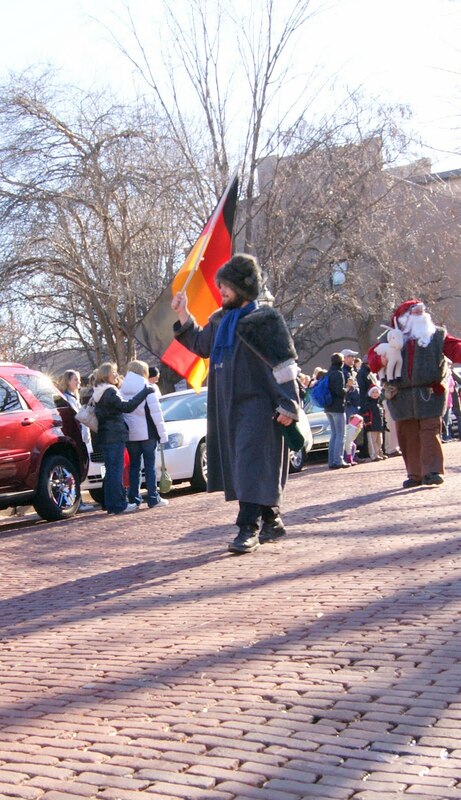 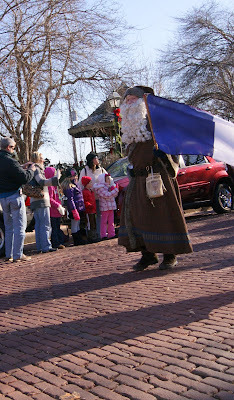 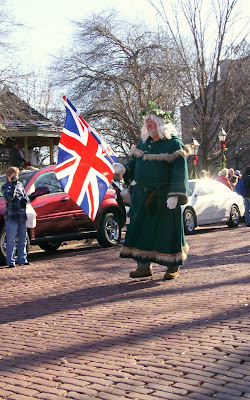 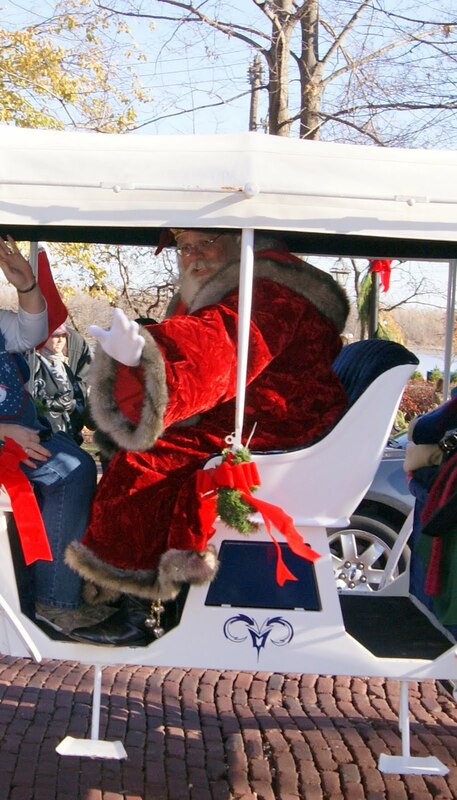 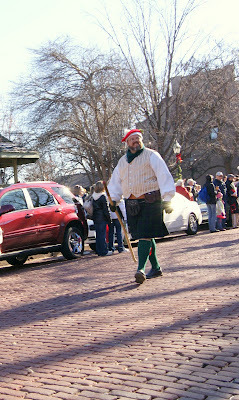 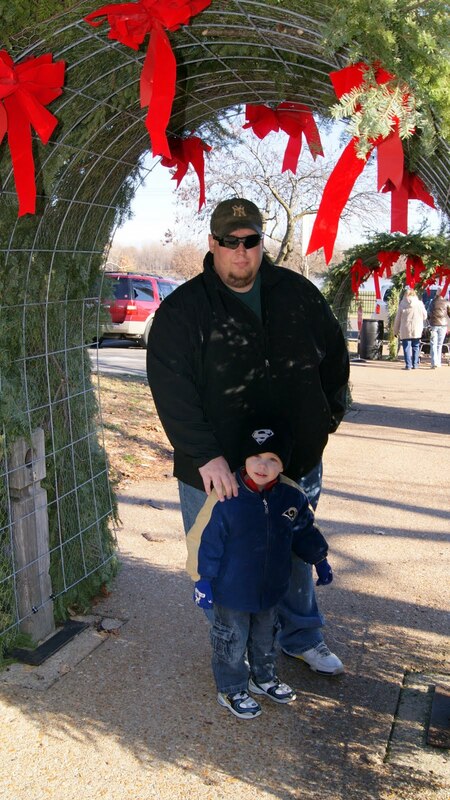 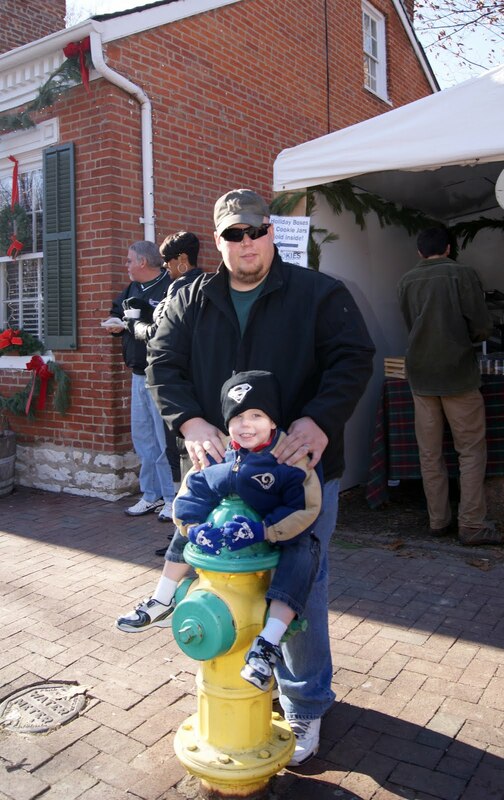 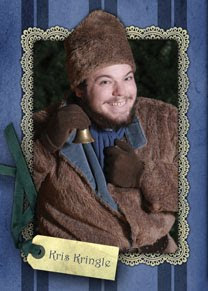 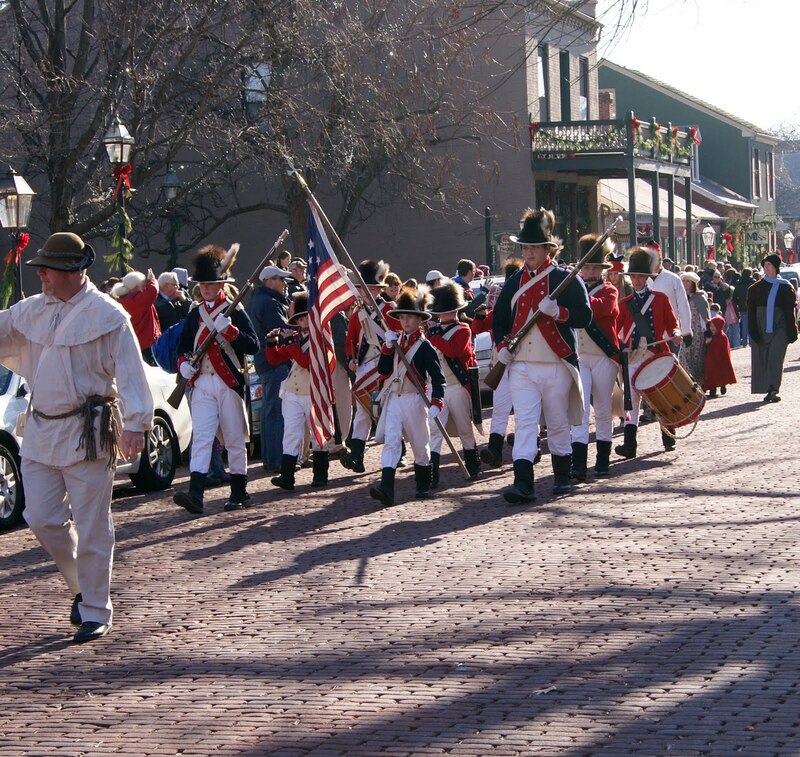 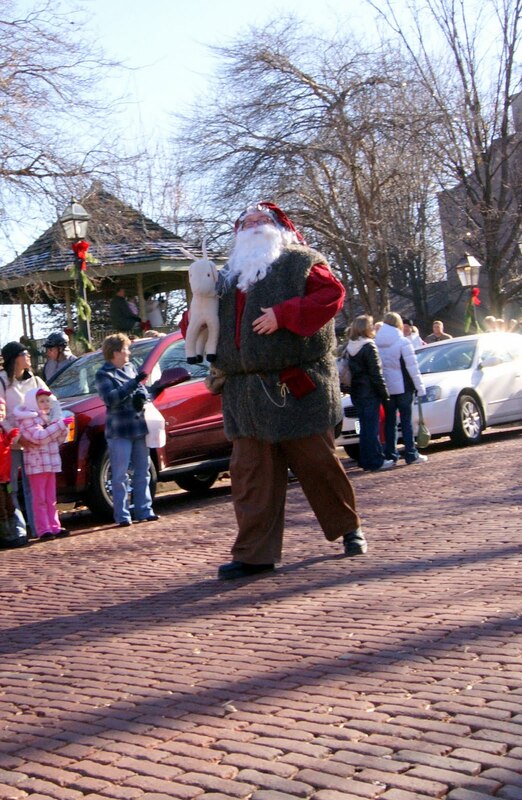 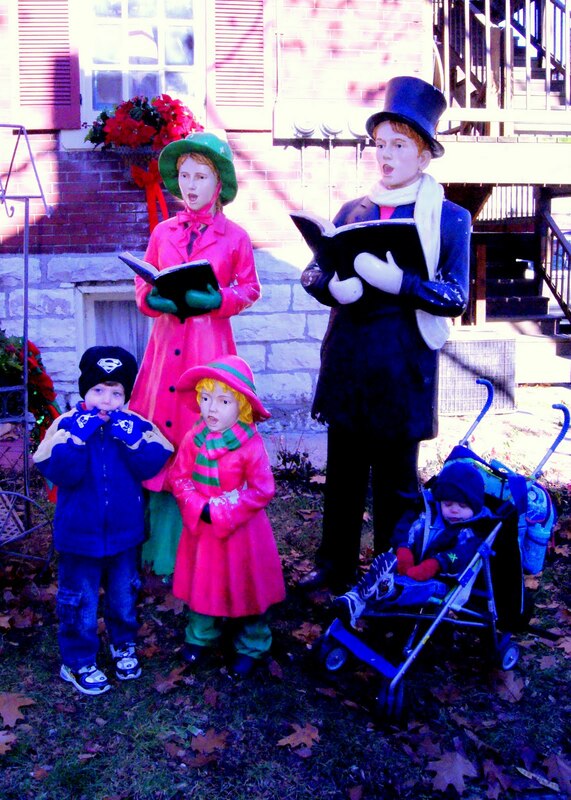 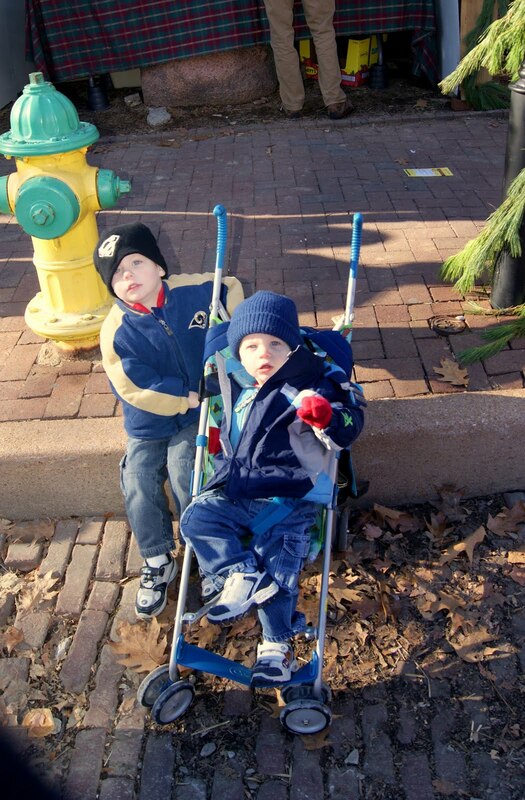 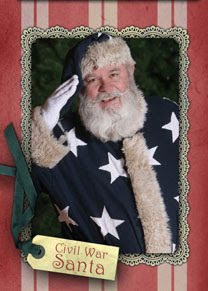 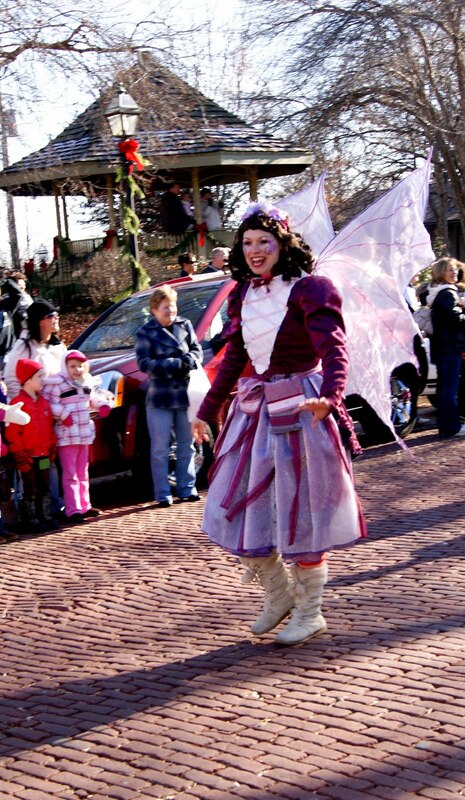 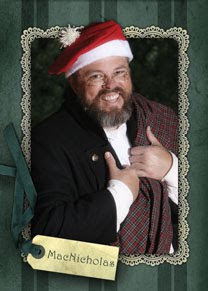 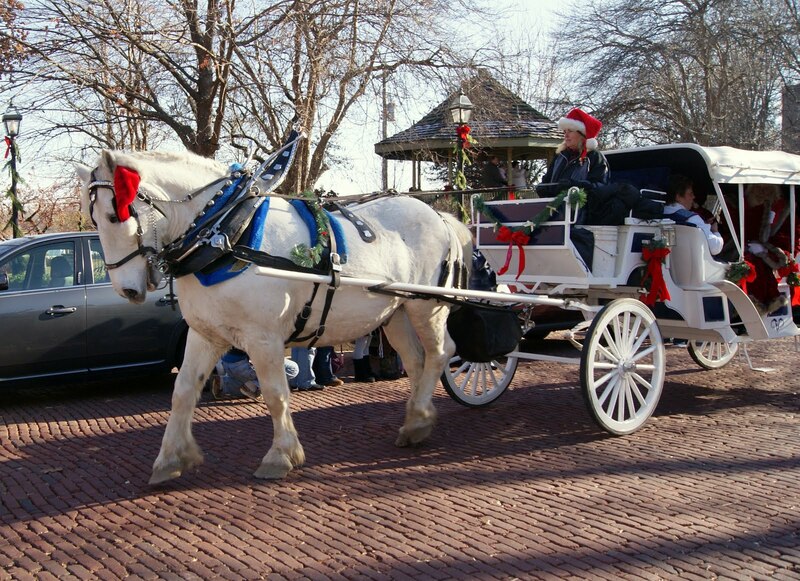 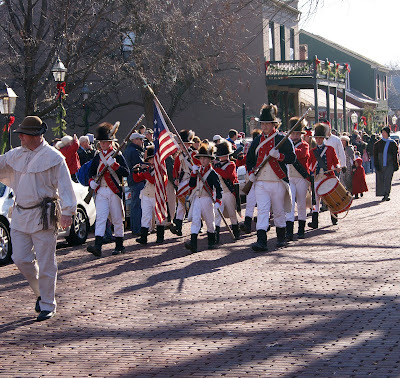 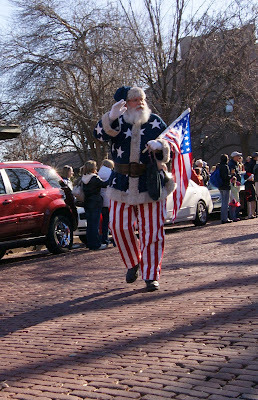 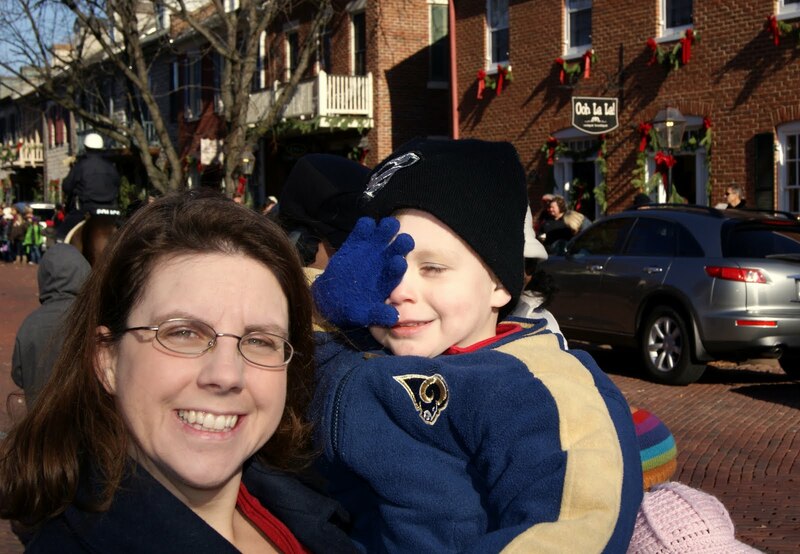 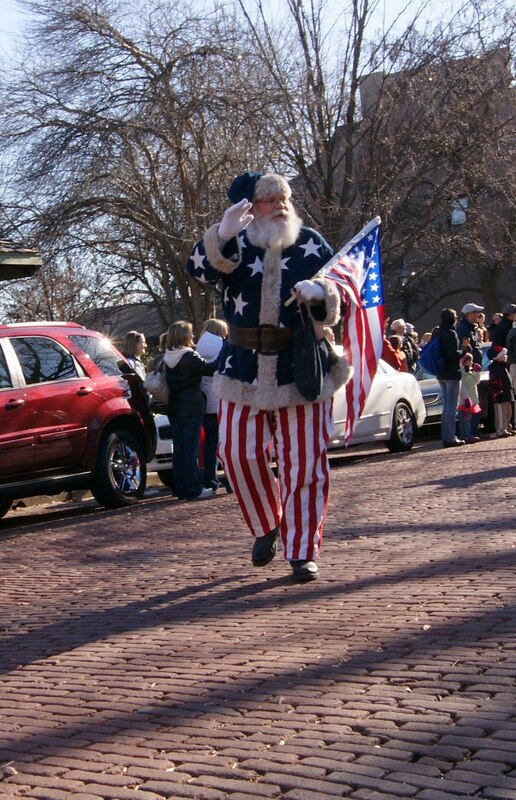 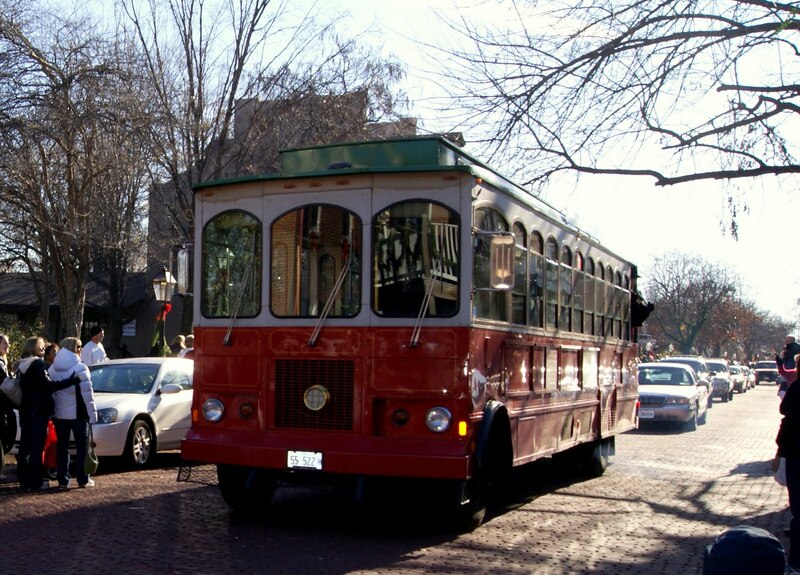 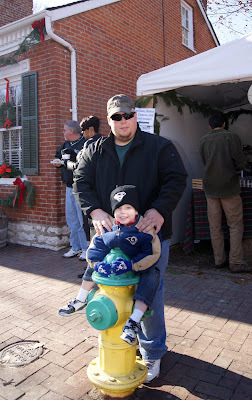 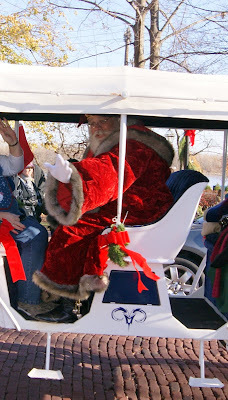 The city of St. Charles has "Christmas Traditions" on Main St, and a Santa Parade on the weekends! 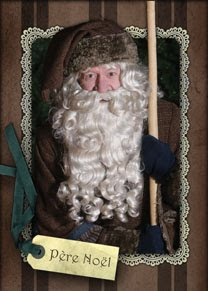 Each costumed person, hands out trading/collectors cards! 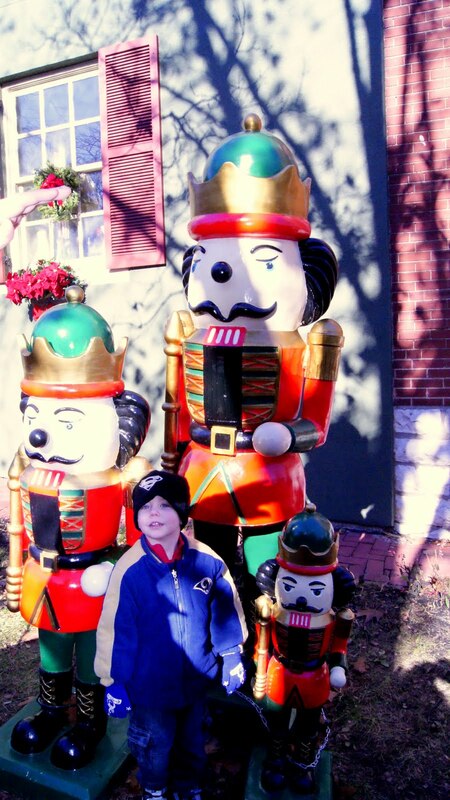 Mikey and a few Nutcrackers. Mikey and Ryan with the Christmas Carolers. 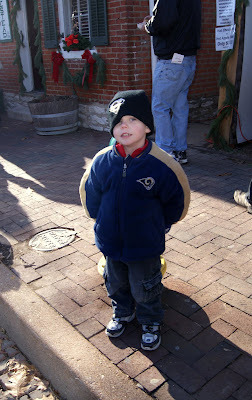 Mikey waiting for the parade to start. 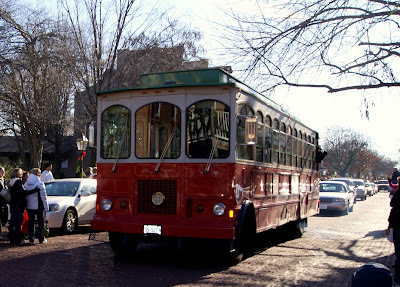 What would Christmas be without a trolley?